Click here for my previous PEN posts. Revenue and operating profits both fell 5%, while the EPS surge was due to PEN receiving R&D tax credits relating to 2012, 2013 and 2014. The 2014 annual report small-print suggests PEN spent nearly £100k on tax advice to gain the credits, so operating profits would have otherwise been flat. I wonder if that “anticipated weighting towards the second half” is code for “expect a weak first half”? It often is with smaller companies — more so if they have just owned up to a couple of delayed/deferred contracts. I believe Customer 5 to be BAE Systems Australia — and I’m concerned this client’s current £16m contract with PEN may be almost completed. You see, PEN has already received revenue of £11.7m from Customer 5/BAE Systems Australia during 2013 and 2014, and this week’s results suggested the £16m contract would be concluded during the second quarter. As such, there may not be much revenue from BAE Systems Australia to come during the latter half of 2015, which could easily hurt profits. For what it is worth, I do not get the impression the subsequent support income from the contract with BAE Systems Australia will entirely replace the agreement’s initial equipment-related revenue. * Where is the cash tax refund? I’m a bit irritated about an apparent U-turn on a cash tax refund. “The Group has successfully made claims in respect of Research and Development Qualifying Expenditure for the periods ending 31 December 2012 and 31 December 2013. This has resulted in a cash refund of approximately £0.645m and an increase in the allowable tax losses carried forward within the Group to £0.833m. In contrast, this week’s results showed no sign of the £645k cash refund and the group actually paying tax of £283k during 2014. The results also confirmed the “further claim” for R&D tax credits for 2014 had been successful, and the credits for 2012, 2013 and 2014 were all applied to the 2014 figures. January’s pre-close statement now looks very confusing — PEN has not explained why the refund has not appeared and has not explained why it ended up paying tax in 2014. I’m guessing the successful R&D credit claim for 2014 has involved some subsequent tax-payment negotiations with HMRC, leaving PEN to pay lower taxes in future rather than receive a refund. Either way, PEN’s inconsistency with its tax disclosures does not put its financial reporting in a favourable light. I’m alarmed as the £803k cash used was far, far higher than PEN has ever spent annually on intangibles since 2000 — and the vast majority of this expenditure (£761k of £803k) occurred in the weaker H2. But this development expenditure has no guarantee of success and, surprisingly, the chairman’s statement did not refer to this significant cash movement. 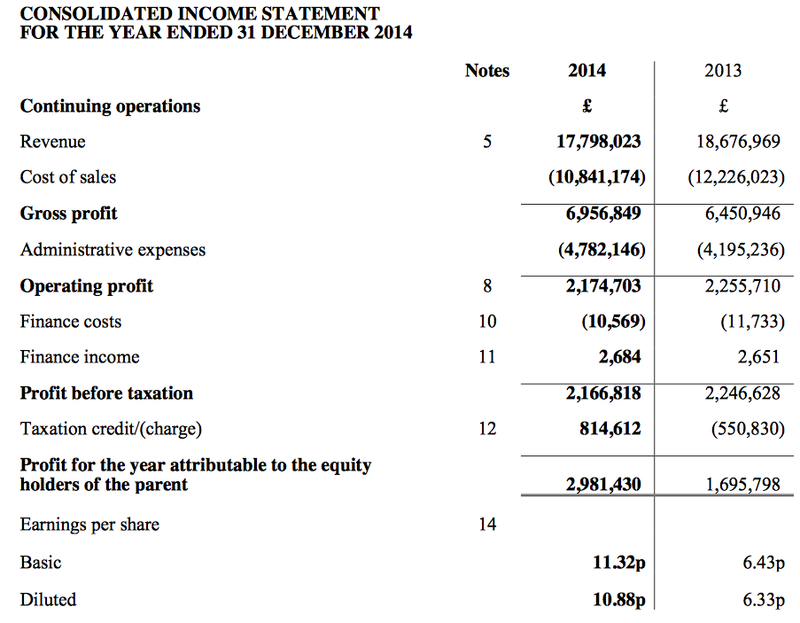 It leaves me thinking this expenditure has been capitalised on the balance sheet simply to shore-up reported profits. I had hoped for PEN’s results to show a favourable working-capital movement. As I noted in my January PEN write-up, the prior half-year results had showed a positive working-capital movement (+£239k) following two years of negative movements (2012: -£1,025k; 2013: -£1,715k). However, this week’s 2014 results showed a further negative movement of £587k for the full year. That means the weaker H2 witnessed a substantial £826k absorbed into working capital. Aggregate operating profits for 2012, 2013 and 2014 come to £6,027k, of which cash totalling a significant £3,327k was sucked into working capital. It all implies PEN has been struggling to produce free cash from its operations of late. The tax-refund U-turn, the hefty intangible expenditure and the cash diverted to working capital never featured in the results commentary. But receiving a mention in the chairman’s statement — and the January pre-close statement as well — was the £1.1m upward revaluation of PEN’s freehold assets. Land and buildings now enjoy a revised book value of £2.3m (8.8p per share). A cynic might claim this revaluation was timed to deflect attention away from the delayed contracts, the weaker H2 and everything else going on in the accounts. He is relatively young and has not served as a proper FD as far as I can tell. True, Mr Snook’s total pay has doubled between 2011 and 2014 to match the (almost) doubled income for shareholders from the dividend (1.5p to 2.9p). But £405k is still a fair whack for a business with operating profits of c£2m. I now feel there are much better-value executives working at alternative small-caps. Granted, PEN’s headline figures seemed fine and the 11% dividend lift underpinned management’s confidence. But there was a lot to dislike about these results. I suppose I could live with the concentrated customer base, or the tax refund U-turn, or the intangible expenditure, if everything else about the results appeared healthy. But taken together, there were just too many irritations, worries and alarm bells ringing for me to remain comfortable holding these shares. In my view, the weaker H2, the “anticipated weighting towards the second half”, the delayed contracts and the significant intangible/working-capital expenditure in particular could all be pointing towards profit trouble later this year. Indeed, I wrote in my January PEN write-up that “the last thing I want is for the business to quickly fall back into its humdrum ways of 2000-2009.” Remember, this business has only really prospered since 2010, and these figures have left me doubting the sustainability of the recent profit levels. Sadly for me, I was too busy looking at the results from French Connection to act quickly and immediately sell my PEN shares on the day of the results. I ended up extricating myself at an average of 79p, which is a touch galling when the price was 100p earlier in the week. My records show I bought at 74p in October and November 2013, and with dividends collected my overall return is 10%. Hardly fantastic, but I wish every share I’ve owned where the story has deteriorated had delivered such a gain! Disclosure: Maynard does not own shares in Pennant International. Sorry to see the PEN news and your get a little caught out. Great reports and a decisive move to bail out. I was actually tracking this one and considering an entry but now I’ve read your in depth analysis I think I’ll stay away! Thanks for the great update as you say you can’t win them all but at least you are up.